Mix the above ingredients in a bowl. Rub the pork and marinate, let rest for at least 1 hr. Set aside. Mix chicken broth, tomato paste and barbeque paste in a bowl. Place onion in the bottom of a slow cooker. Put the marinated pork on top of onions. Pour chicken broth combination on top and sides. Cover and cook on low for 8-10 hrs. Remove pork from slow cooker and let rest until cool enough to handle. Shred with 2 forks and return to slow cooker. Strain accumulated liquid on a saucepan, discard onions. Boil until sauce is reduced and thickened, you may adjust seasoning at this point. If you want to make it thicker, you may add cornstarch dispersed in water. Pour some sauce on top of shredded pork and may serve some on the side. 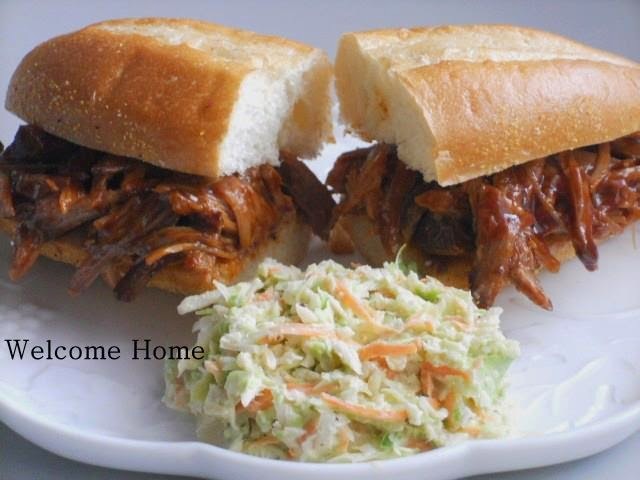 Another option is to discard accumulated liquid and use your favorite barbeque sauce to make a sandwich. Make a sandwich and serve with coleslaw. Bread of your choice – I used Hoagie bread this time and sometimes we use burger buns. I especially love a good coleslaw!! The pulled pork sounds delicious!! I pinned this and hope to try soon! !